Killed age 23 on the 31st of August 1943. Son of Albert Ernest Jackson and of Maude Alice Jackson (Nee Holton), of Hamilton, Auckland, New Zealand. Grave location – 16. C. 7. Stirling Mk.111 EE918 AA-D and was returning home, having dropped bombs on Berlin, when the aircraft was hit by enemy fire. The aircraft sustained damage but continued to fly for possibly 10 – 15 minutes. Eric Roberts, the Pilot, radioed Jack Haydon (as Mid Upper Gunner he was the closest to the rear gun turret) and requested that he go back and check on Darcy Haub, (rear gunner) because he had heard nothing from him since the attack. Jack discovered that he was dead and was returning to his position when there was an explosion which broke the plane into two pieces. Killed age 27 on the 17th of December 1942. Son of William Edward Moxhay Jacobson and Florence Alsager Jacobson, of Akaroa, Canterbury, New Zealand; Husband of D. I. Jacobson, of Dover, England. Grave location – 17. A. 17. W/O Oldrich Jambor, RAFVR 787441 – 2nd Pilot. Killed age 29 on the 31st of May 1942. Buried Apeldoorn (Ugchelen-Heidehof) General Cemetery, Holland.. Grave location – Plot 4. Grave 141. Twenty-three Wellington aircraft, including IA, IC,III, were detailed to carry out the above attacks. One of these aircraft, Wellington IA T.2894, captained by P/O Johnson (attached to this Unit from C.G.S. Suton Bridge) failed to return to base. Another aircraft X.3751 captained by P/O Jarman, was badly damaged by flak, both fuel tanks being holed and both port and starboard airspeed indicators rendered unserviceable. The bomb load consisted of 4000lbs, 1000lbs, 500lbs and 30lbs. and 4lbs incendiaries. The weather conditions were excellent, and the target was bombed successfully many fires being started in all parts of the town. A.A. fire was very erratic and searchlights were working in cones. A large number of enemy aircraft were seen but no attacks resulted. Navigation was by D/R, TR, Q.D.M., Loop. 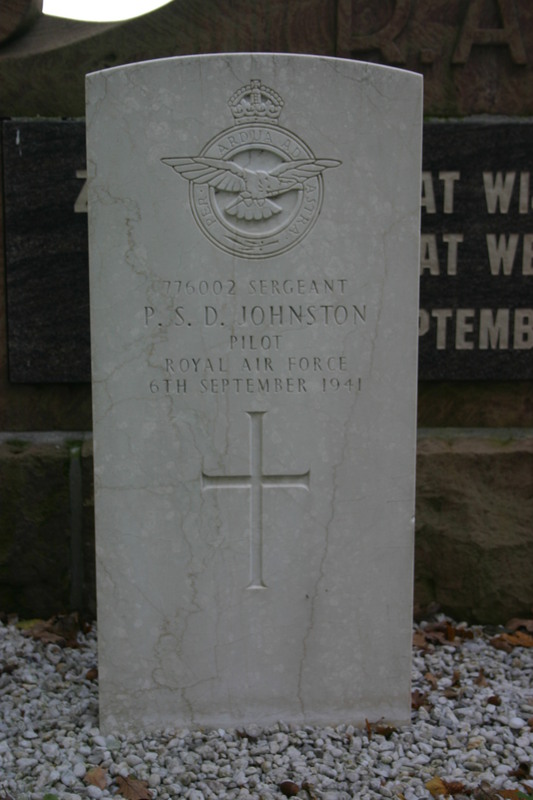 P/O David Malcolm Johnson, RAFVR 103511 – Pilot. F/L Hector Austin Charles Batten, RAF 61948 – Observer. F/S Josiah Robert Connor, RAFVR 621339 – Wireless Operator. F/S John McKenzie Mclean, RAFVR 968453 – Front Gunner. F/S G.J. Waddington-Allwright, RAFVR 751360 – Rear Gunner. A ‘borrowed’ Wellington Mk IA, T2894, from Central Gunnery School, Sutton Bridge, was shot down by a night-fighter over Holland. The only survivor was the rear gunner, who was taken prisoner of war. All other crew members died. Killed age 34 on the 4th of November 1943. Son of Isaac James and of Elizabeth James (Nee Richardson), of Haydock, Lancashire; Husband of Joan C. James, of Balclutha, Otago, New Zealand. Grave location – Allied Plot. grave 56. Sgt. 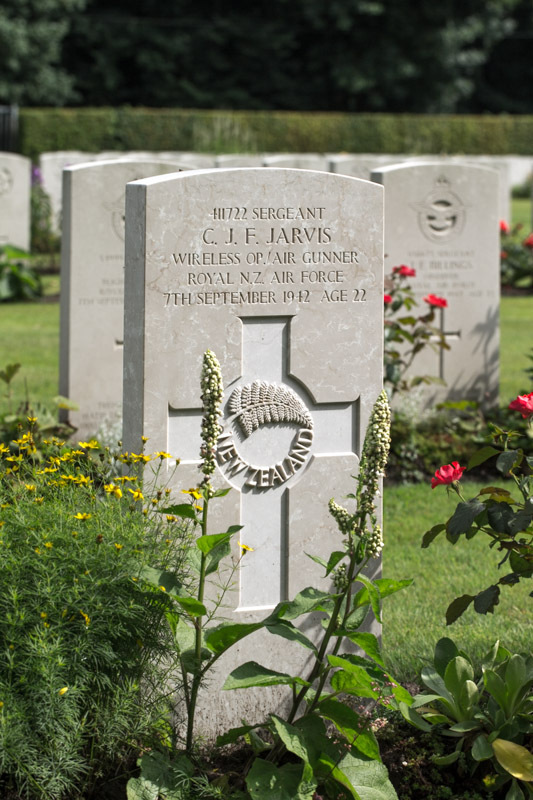 Claude Joseph Frederick Jarvis, RNZAF NZ411722 – Wireless Operator. Killed age 22 on the 7th of September 1942. Son of Frederick Joseph Jarvis, and of Blanche Jarvis (Nee Ball), of Hastings, Hawkes Bay, New Zealand. Grave location – Coll. grave 16. F. 8-10. Wellington BJ772 captained by F/Lt. Womersley was attacked from rear on return by an enemy aircraft, one bursts was fired by the rear gunner and the enemy aircraft was driven off. No other enemy aircraft was seen. The weather was good, clear over target with slight ground haze. Navigation was good. Wellington BJ.765 captained by Sergt. Sharman G.W and Wellington X.3867 captained by F/Sgt.Parkes W.R. failed to return. Sgt. George William Sharman, RNZAF NZ412746 – Pilot. Sgt. Norman Priestly Saul, RNZAF NZ411730 – Observer. P/O George William Alfred Mills, RNZAF NZ411769 – Front Gunner. Sgt. Thomas Edward Coles, RNZAF NZ40161 – Rear Gunner. Wellington Mk.III BJ.765 AA-L was brought down over Germany, crashing near Krefeld, 11 miles South West of the target, Duisburg. There were no survivors. All five crew were initially buried in the military Cemetery, Krefeld, but later reinterred at Reischwald Forest Cemetery, South West of Kleve. Killed age 25 on the 23rd of September 1943. Son of William Edward and Mary Elizabeth Jarvis, of Yerongapilly, Queensland, Australia. Grave location – 18. B. 4. P/O Edward Arthur Jelley, RAFVR 78762 – Rear Gunner. Died of injuries age 33 on the 30th of September 1940. Son of Arthur and M. L. Jelley, of Stapenhill, Staffordshire. Buried Swalincote District (Church Gresley) Cemetery, Derbyshire, England.. Grave location – Sec. 3. General. Grave 959. Ten Wellington aircraft were detailed to carry out individual attacks on the above targets. A mixed bomb load was carried and was made up of 500lbs. bombs, 250lbs. bombs fused N.D.T., 250lbs. bombs, delayed action, and containers of incendiaries. CB.213 reports that target was located and bombs dropped. No results were observed by CB.214, except for small fire started north of target. CB.216 failed to locate target owing to 10/10 cloud and difficulty in pinpointing. Heavy bombs dropped on DELMENHOERST AERODROME, hits believed, and incendiaries dropped on DE KOOY AERODROME where a few small fires were started. CB.217 dropped though cloud – on target, but results were unobserved. Owing to ten-tenths cloud, CB.215 failed to locate the target, but bombs were dropped at NORDHERN AERODROME. Bursts seen slight short. CB.218 dropped bombs from 10,000 on first run, bursts being observed. A second was made and the remaining bombs dropped. Target was not located by CB.219 owing to 9/10 cloud. Bombs dropped at MADGEBURG and bursts observed. CB.223 dropped a stick of 8-250lbs. bombs along railway marshalling yards at MANNHEIM. Bursts observed on permanent way in woods S.E. of MANNHEIM. CB.224 failed to locate original target and bombs were dropped in one stick on marshalling yards at KOBLEMZ. Results unobserved. CB.225 dropped bombs in one stick. Bursts seen on railway line. Several small explosions and one large fire seen for 30 miles after leaving target. One aircraft seen, by CB.214, shot down over EILENBURG. Dummy aerodrome seen about four miles East of DELMENHOERST. Circle of white lights about a mile in diameter, with sharply defined red arrows in centre pointing S.W. in position 52*N. 0.8.43E. Heavy A.A. fire in all parts of target areas. Searchlights were very active and accurate. Several enemy aircraft seen at various parts of target areas. Five-tenths to 10/10 cloud was experienced over whole. P/O Frank Henderson Denton, RAF 36238 – Pilot. Sgt. White, RAF – 2nd Pilot. Sgt. Andy’ Orrock, RAF – Navigator. Sgt. Leonard A. Hayter, RAF 649376 – Wireless Operator. Sgt. James ‘Jimmy’ Farquhar, – Front Gunner. P/O Edward Arthur Jelley, RAF 78762 – Rear Gunner . One of these aircraft, CB.213 failed to return to base, having crashed in Devon through lack of Petrol. One member of the crew, P/O. 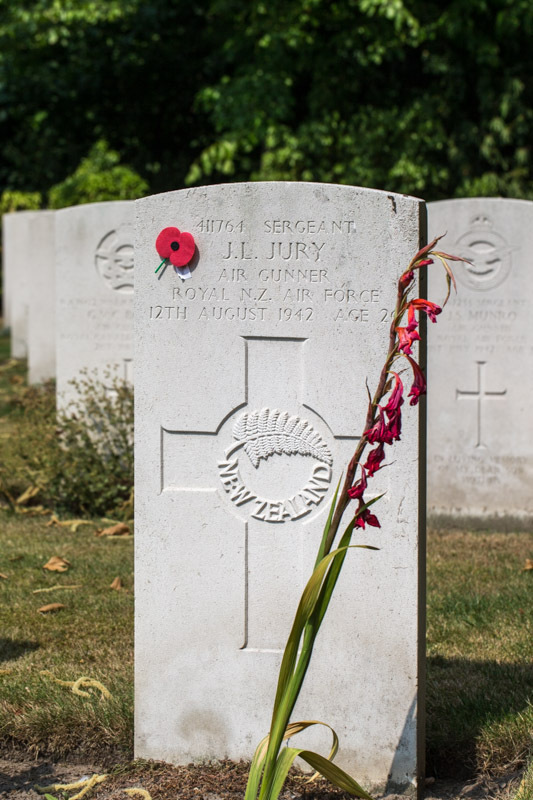 Jelley the rear gunner, was killed, but the other members all parachuted to safety. Killed age 23 on the 16th of December 1943. 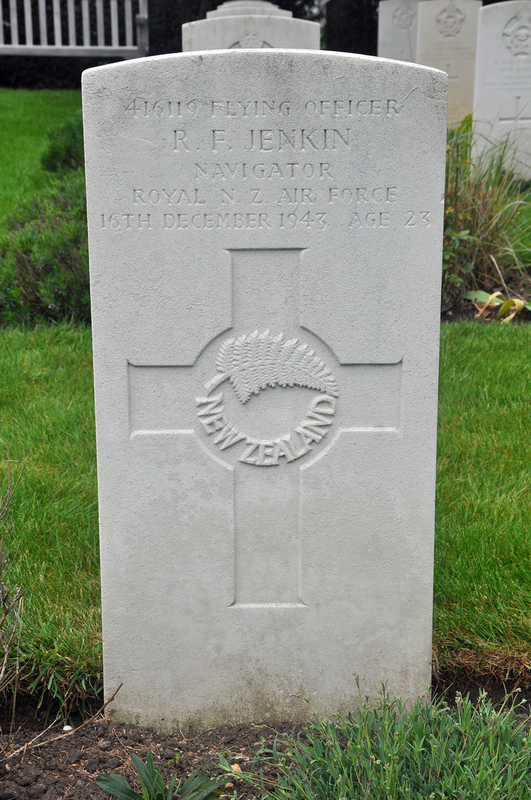 Son of Carl Reginald Jenkin and of Ivy Clarace Jenkin (Nee McMahon), of Mission Bay, Auckland, New Zealand. Grave location – Grave 14348. 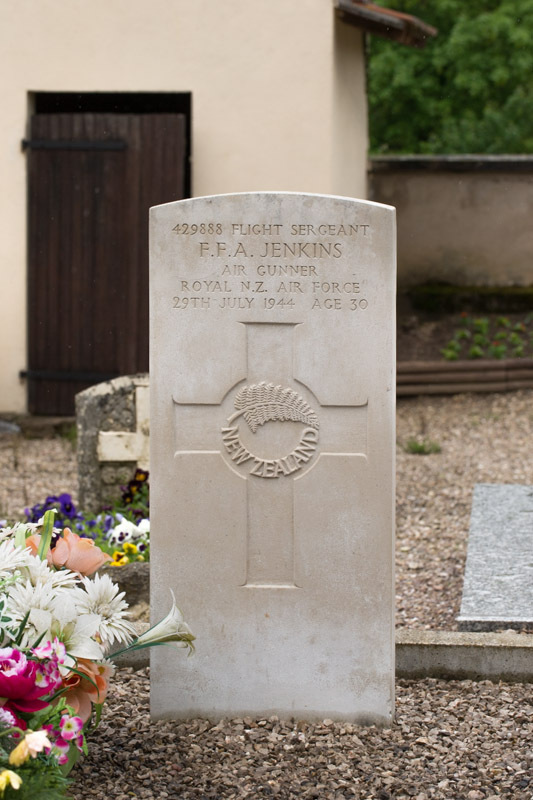 W/O Ernest Roy Jenkins, RNZAF NZ405780 – Wireless Operator. Killed age 25 on the 29th of April 1943. Son of Ernest Paul and May Levina Jenkins, of Waharoa, Auckland, New Zealand. F/S Frederick Francis Arthur Jenkins, RNZAF NZ429888 – Mid Upper Gunner. Killed age 30 on the 29th of July 1944. Son of Frederick Charles Jenkins and of Marie Jenkins, (Nee Ashley), of Okato, Taranaki, New Zealand; Husband of Joan Jenkins, of New Plymouth, Taranaki. Buried Millery Communal Cemetery, France.. Grave location – Grave 3. Twenty two aircraft set out as detailed to attack Stuttgart. Twenty aircraft successfully bombed the target with the aid of markers, but it is thought that several aircraft undershot, as they appeared to be two concentration of fires 2-3 miles apart. Fighters were very active in the target area and also en route, several aircraft having combats. The aircraft captained by NZ413043 A/S/L. L. Drummond, was attacked five times by a JU88, all of which were indecisive, followed by an attack by an unidentified enemy aircraft which is claimed as destroyed, being seen to go down in flames. At the same time as this our aircraft was also being attacked by two JU88s, one of which was damaged by fire from our aircraft. Two aircraft failed to return, they were captained by NZ421403 A/F/L. N. Stokes & NZ421469 F/O. I. Blance. P/O Ian Edward Blance, RNZAF NZ421496 – Pilot. 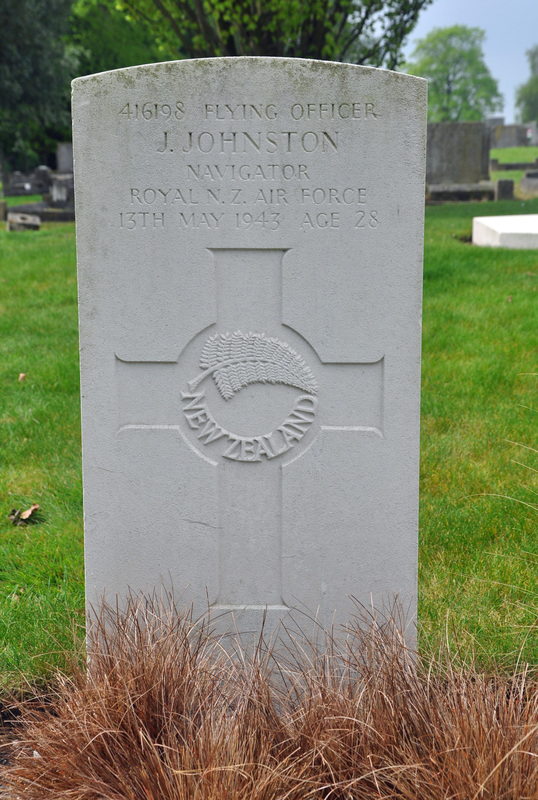 F/S Colin Frederick Johnson Grieg, RNZAF NZ422281 – Navigator. F/S Ronald Howard Spencer, RAFVR 1575186 – Air Bomber. F/S Frederick Walter Percival Climo, RNZAF NZ4210148 – Wireless Operator . Sgt. W.J. Hyde, RAFVR 1895228 – Flight Engineer. F/S Aubrey Charles Kirk, RNZAF NZ425845 – Rear Gunner. Lancaster Mk.III ND756 AA-M was shot down in flames by a night-fighter over France, crashing at 01:25hrs close to Millery village, 3 miles North of Pompey. All but the Flight Engineer, Navigator and Rear Gunner died and were buried at the Millery cemetery. The surviving three crew members had baled out of the burning aircraft successfully. Sgt Hyde (F/E) and F/S Kirk (R/G), evaded capture and escaped but F/S Grieg (Nav) was captured as prisoner of war. It was revealed that 1,500 local inhabitants of Millery Village turned out for the funeral of the four airmen who died. Two large rooms in the church were overflowing with flowers. Sgt. Harold Jennings, RAFVR 1818122 – Mid Upper Gunner. Killed age 19 on the 28th of August 1943. Son of Henry and Lily Louise Jennings, of Spring Hill, Birmingham. Grave location – Joint grave 9. C. 25-26. Nineteen aircraft were detailed to attack the above targets with incendiary bombs of 30lbs. and 4lbs. One aircraft failed to return, but the remainder successfully dropped their bombs in the target area. Good concentrated fires and heavy explosions were seen. A moderate barrage consisting of light and heavy A.A. fire co-operating with searchlights were encountered, and two aircraft received slight damage. Some enemy aircraft were seen, one short combat took place, but no damage was sustained by our aircraft. The weather was cloudy on the outward journey but clear over the target and visibility was good. Navigation was very good. The missing aircraft was Stirling Mk.III EE955 captained by F/Sgt. Higham. F/S Frank Douglas Higham, RNZAF NZ416116 – Pilot. Sgt. John Richard Culshaw, RAFVR 1437100 – Navigator. Sgt. Martin Bailey, RCAF R.119568 – Air Bomber. F/S Cyril Jack Bridger, RNZAF NZ417192 – Wireless Operator. Sgt. Robert Renfrew, RAFVR 984047 – Flight Engineer. Sgt. Albert Clarke, RAFVR 940903 – Rear Gunner. Stirling Mk.III EE955 AA-D was brought down at Schwarzenau, 12 miles ENE of Würzburg. The circumstances are unclear as to how EE955 was brought down, although the location of the crash was some 60miles NW of Nuremberg ground defences, suggesting the likelihood of night fighter action. All of the crew were killed and are buried in Durnbach War Cemetery, 9 miles east of Bad Tölz. Sgt. Frederick John Leigh Joblin, RNZAF NZ417063 – Air Bomber. Killed age 25 on the 24th of May 1943. Son of Frederick Leigh Joblin and Ivy Joblin, of Morere, Poverty Bay, New Zealand; Husband of Mary Esther Joblin, of Gisborne, Auckland, New Zealand. Buried Beesd General Cemetery, Holland.. Grave location – Coll. grave 1-2. Fifteen aircraft were detailed to carry out the above attacks with bombs of 1000lb and incendiaries of 30lb and 4lb. One aircraft returned early owing to engine trouble, and the remaining aircraft successfully dropped their bombs in the target area. Some very large fires were seen, and the bombs were seen to explode amongst large buildings. Medium and Heavy A.A. Fire co-operating with searchlights was encountered. One aircraft was hit whilst over the target, and the port outer propeller was shot off, but the aircraft successfully returned to base. Some enemy aircraft were seen, and two short combats took place, but no damage was sustained to our aircraft. The weather was good in the target area, but identification was difficult owing to smoke from the fires. Navigation was very good. Stirling Mk.III,BK.783 captained by Sergeant S.M. Tietjens failed to return. Sgt. Stephen Muir Tietjens, RAFVR NZ415640 – Pilot. Sgt. George Watson Turnbull, RAFVR NZ421342 – Navigator. Sgt. 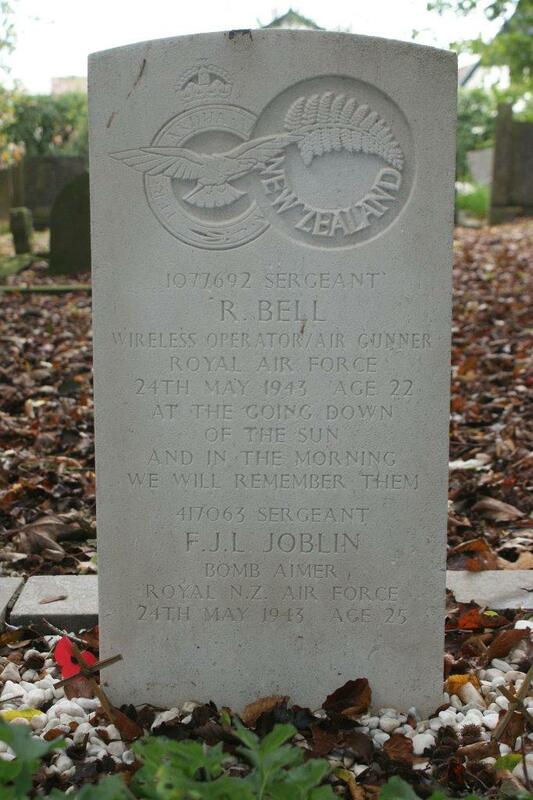 Ronald Bell, RAFVR 1077692 – Wireless Operator. Sgt. Stanley John Wayman, RAFVR 1391814 – Flight Engineer. Sgt. Derrick George Amos Storey, RAFVR 1809725 – Mid Upper Gunner. Sgt. Leslie R Vale, RAFVR 1235008 – Rear Gunner. Stirling Mk.III BK783 AA-Q was shot down by an enemy night-fighter over the Netherlands on the return flight home. The aircraft came down in a ditch at Beesd, (Gelderland), 5 miles South South West of Culemborg, All but the Rear Gunner, Sgt L R Vale, died in the crash. They were buried in a collective grave at Beesd General Cemetery. Vale miraculously survived the major crash with an injured leg and temporary memory loss. He was later taken prisoner by German soldiers. Killed age 20 on the 28th of November 1942. Son of John and Mary Edith Jobson, of South Broomhill. Buried Chevington Cemetery, Northumberland, England.. Grave location – Sec. G. Grave 21. F/S Arthur Grahame Johns, RNZAF NZ41907 – Pilot. Son of Arthur I. Johns, and of Eileen Mariane Johns (Nee Mathias), of Auckland City, New Zealand. Grave location – 15. E. 10. Killed age 21 on the 31st of May 1942. Son of Malcolm Edward and Dora Edith Johnson, of Wembley, Middlesex; husband of Dinny Lorraine Johnson. Grave location – Plot 4. Grave 137. 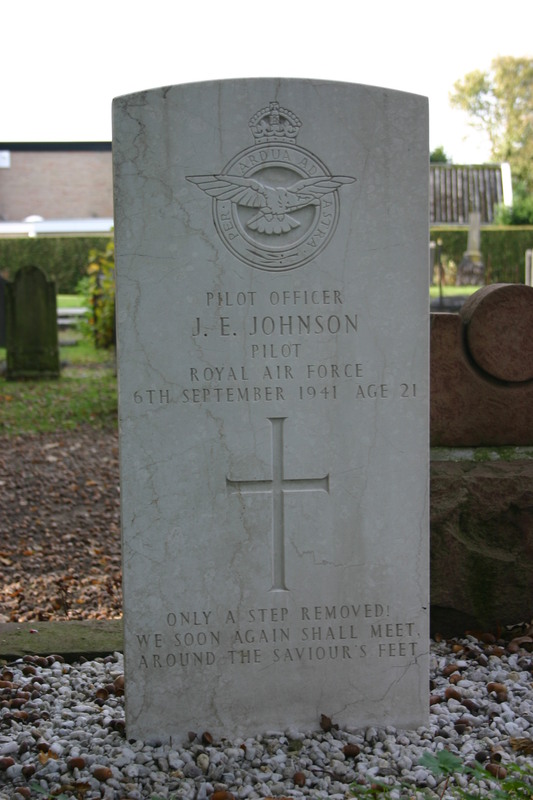 F/O James Johnson, RAFVR 176437 – Pilot. Killed age 26 on the 21st of October 1944. Son of James and Mary E. Johnson; Husband of Marian K. Johnson, of Stafford. Grave location – 13. B. 11. Twenty five aircraft took off to attack Flushing. All crews were able to identify the target visually and bombing was reported as being very accurate. A.A. opposition was moderate. One aircraft (Captain 176437 F/O J. Johnson) failed to return, but was seen to be shot down over the target by heavy A A fire. 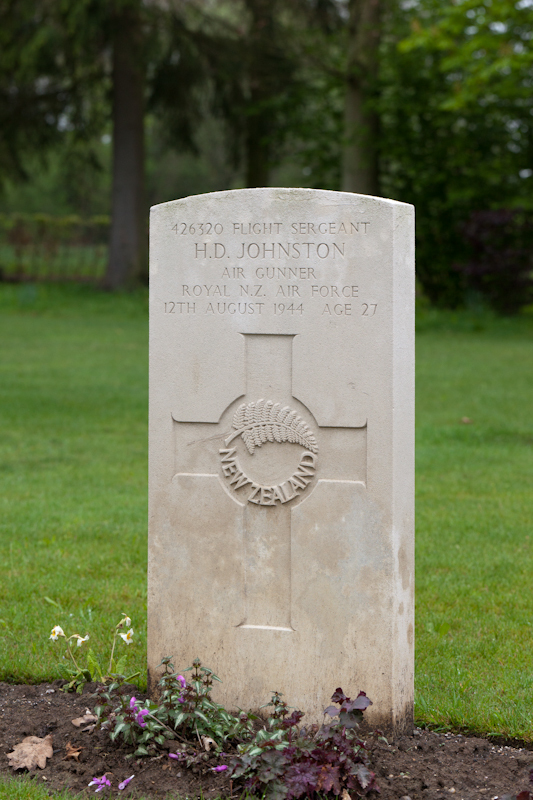 F/O James ‘Johnny’ Johnson, RAFVR 176437 – Pilot. W/O Thomas Talbot ‘Tommy’ Murdoch, RAFVR 1345478 – Navigator. F/O Alexander Mitchell ‘Mitch’ Penman, RNZAF NZ416154 – Air Bomber. Sgt. 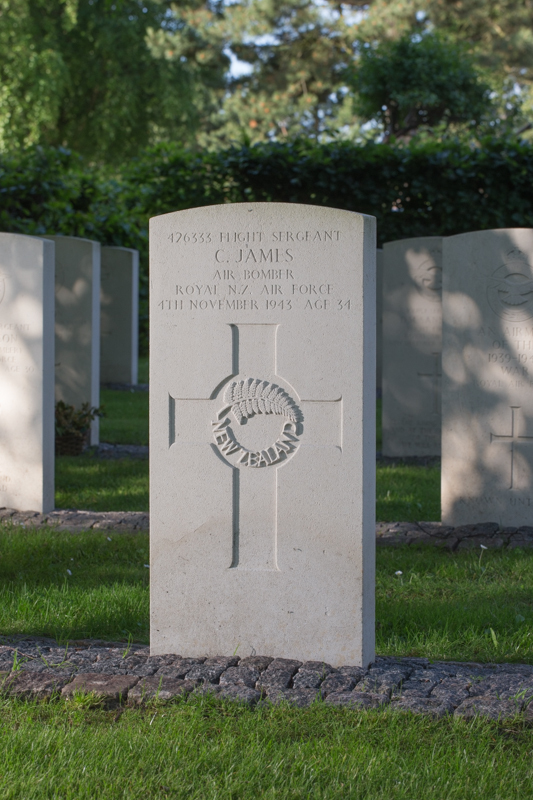 James ‘Jimmy’ Smith, RAFVR 1604615 – Wireless Operator . Sgt. Lorenzo ‘Larry’ Marfil, RAFVR 1893899 – Flight Engineer. Sgt. Alexander ‘Jumbo’ Reid, RAFVR 2211424 – Mid Upper Gunner. W/O Vincent John O’Loughlin, RAFVR 536970 – Rear Gunner. Lancaster Mk.I HK596 AA-O was engaged in a visual bombing attack against an enemy gun battery near the Port of Vlissengen, Netherlands. At 12:32hrs other crews flying nearby reported seeing HK596 come under heavy AA fire, with at least one engine on fire. Within minutes the aircraft descended quickly near the target area. Five parachutes were seen to deploy before the aircraft hit the ground and broke up. None of the crew survived the late abandonment or the crash. Five were buried in the Bergen op Zoom War Cemetery and two are commemorated on the Runnymede Memorial. Killed age 21 on the 6th of September 1941. Son of James and Edith Agnes Mary Johnson, of Ewell, Surrey. Killed age 27 on the 12th of August 1944. Son of David Robertson Johnston and Margaret Johnston, of Balclutha, Otago, New Zealand. Grave location – Coll. grave VI. G. 1-6. Killed age 28 on the 13th of May 1943. Son of John Robert and Alice May Johnston, of Auckland City, New Zealand; Husband of Agnes Gibson Johnston, of Auckland City. Grave location – Plot P. Grave 445. Killed age 28 on the 6th of September 1941. 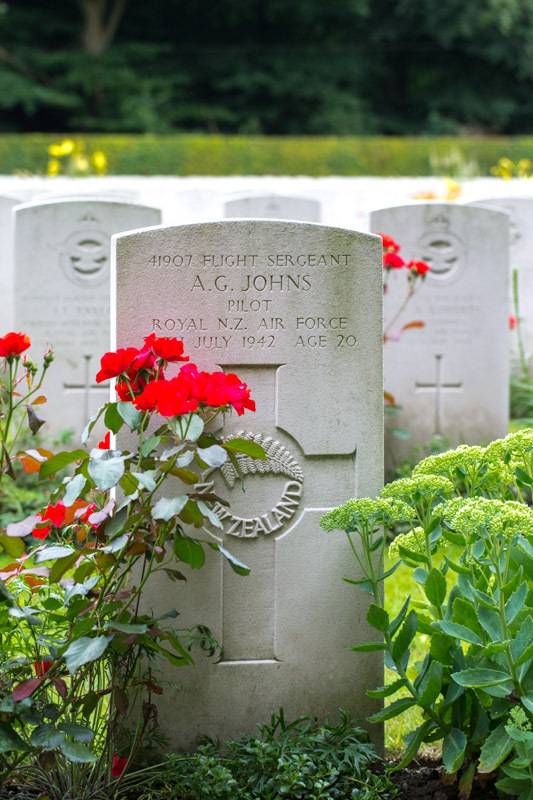 F/S Arthur Stanley Jones, RNZAF NZ421977 – Wireless Operator. Killed age 28 on the 5th of March 1944. 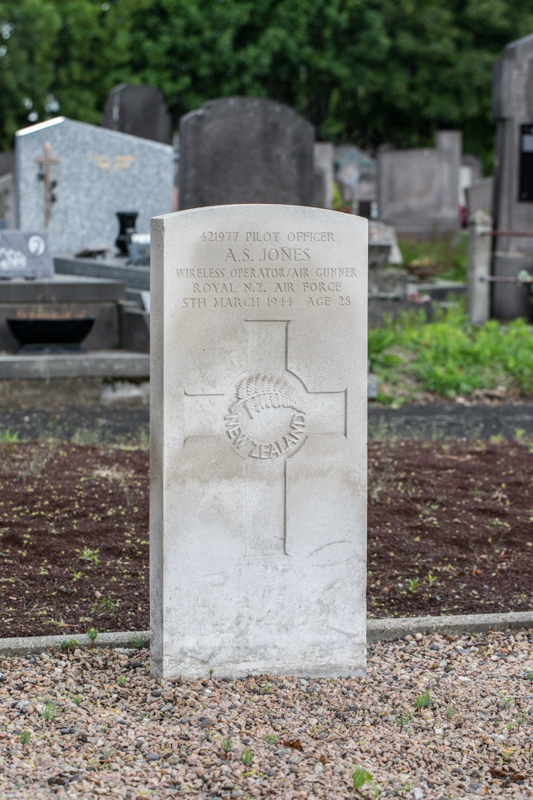 Son of Daniel Jones and of Harriet Jones (Nee Tremplett); Husband of Albertine Francoise Jones, of Wanganui, Wellington, New Zealand. Buried Clermont-Ferrand (Des Carmes Dechaux) Communal Cemetery, France.. Grave location – Row A. Coll. grave 4-6. Operation TRAINER 124 (Result unknown). The m/n. crew in Stirling “M” took off at 20.51 hours. The aircraft failed to return and nothing was heard after take-off. 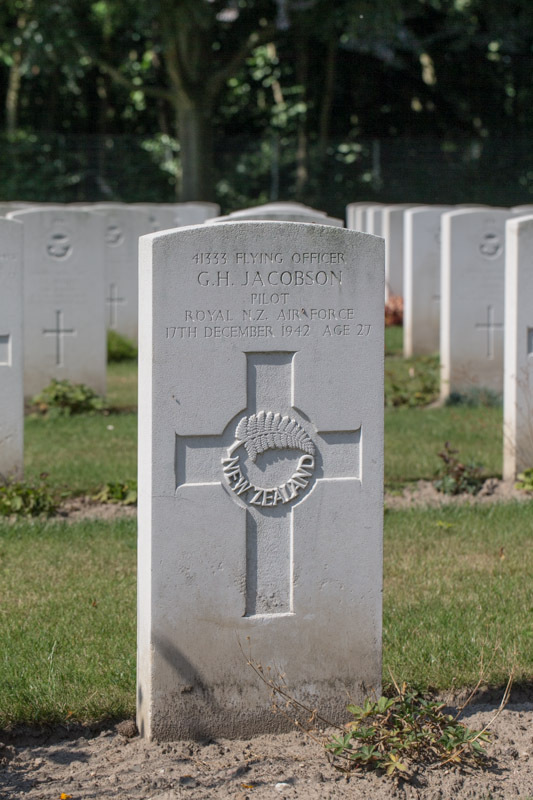 F/O Hugh William Henderson, RNZAF NZ421713 – Navigator. F/S Ralph Morley Woods, RAFVR 1386860 – Air Bomber. F/S Arthur Stanley Jones, RNZAF NZ421977 – Wireless Operator . Sgt. Cyril Beech, RAFVR 1584473 – Flight Engineer. Sgt. Colin Armstrong, RAFVR 2209010 – Mid Upper Gunner. F/S Robert James Ian Melville, RNZAF NZ42349 – Rear Gunner. The wreckage of Stirling Mk.III EF215 AA-M was found on a mountainside at Rochefort-Montagne, 15 miles West South West of Clermont-Ferrand, where six of the deceased crew were buried. The only survivor was Sgt C. B. Armstrong, who escaped with relatively few injuries. He was taken into custody as a P.o.W. Sgt. Daniel Vernon Jones, RAFVR 1337506 – Navigator. Killed age 20 on the 11th of April 1943. 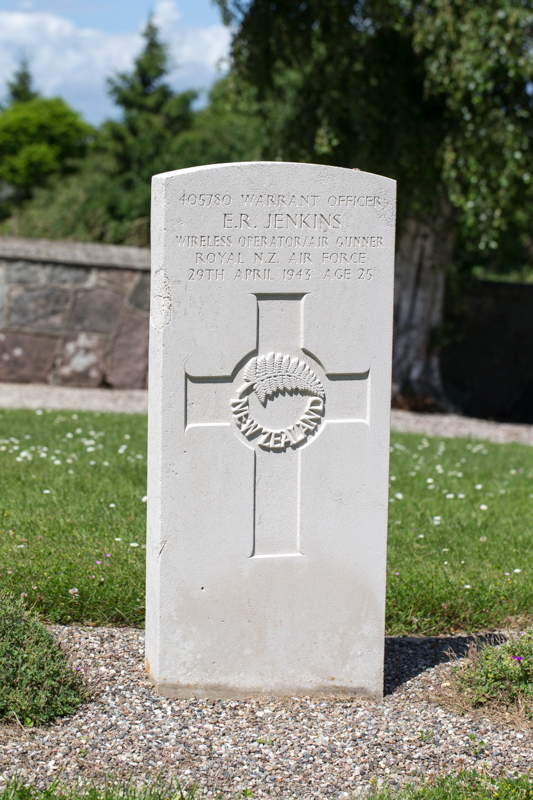 Son of Daniel Jenkin Jones and Elizabeth Mary Jones, of Merthyr Tydfil, Glamorgan. Killed age 19 on the 26th of August 1944. Son Of John Baden Jones And Margaret Jones, Of Hayes, Middlesex. Grave location – 5. H. 11. Lost without trace age 21 on the 3rd of July 1941. Son of Benjamin and Mary Anne Jones, of Rhydding, Neath, Glamorgan. Grave location – Panel 46. Sgt. Henry Edward Jones, RAFVR 1192997 – Rear Gunner. Killed age 19 on the 9th of June 1942. Grave location – 9. F. 13. Twelve aircraft were detailed to attack the above target. Bomb load of 4000lbs, 500lbs, 250lbs and 4 lb inc was dropped in the target area. Owing to haze results were not observed. There was a heavy concentration of flak and searchlights in target area. Two unidentified a/c were observed near Dutch Coast by Well.III, X3720 and were eluded. Weather was good no cloud over target but hazy. Navigation was very good. Well.III, X3587, captained by P/O. Smith and Well.III, Z1573, captained by P/O Murdoch failed to return. P/O Rupert John Smith, RNZAF NZ41950 – Pilot. Sgt. William Graham Clark, RAFVR 903293 – Observer. Sgt. William Robertson Ramsay, RNZAF NZ405508 – Front Gunner. Sgt. Barry Herbert Coulter, RAFVR 1261820 – Wireless Operator. The aircraft was brought down, probably by flak, crashing near Dusseldorf. There were no survivors. All five crew were buried in the Nordfriedhof Cemetery, in Dusseldorf, but later reinterred at Reichswald Forest War Cemetery, South West of Cleve. Lost without trace age 26 on the 21st of July 1944. Son Of Llewellyn O. And Hannah Elizabeth Jones, Of Marton, Wellington, New Zealand. Sgt. David Campbell Joyce, RNZAF NZ401278 – 2nd Pilot. Fatally Wounded, died later in hospital age 21 on the 16th of July 1941. Son of Austen Adams Joyce and Fanny Elizabeth Joyce. Grave location – Row A. Grave 8. Nine Wellington aircraft were detailed to carry out individual bombing attacks against the above targets. One of these aircraft, R.3171 captained by SGT. Fotheringham, failed to return to base. Another, W.5663, captained P/O Rees, (RJT.533) was attacked by unidentified enemy fighter over the target. The aircraft was badly damages and the 2nd Pilot Sgt. Joyce was killed. SGT. 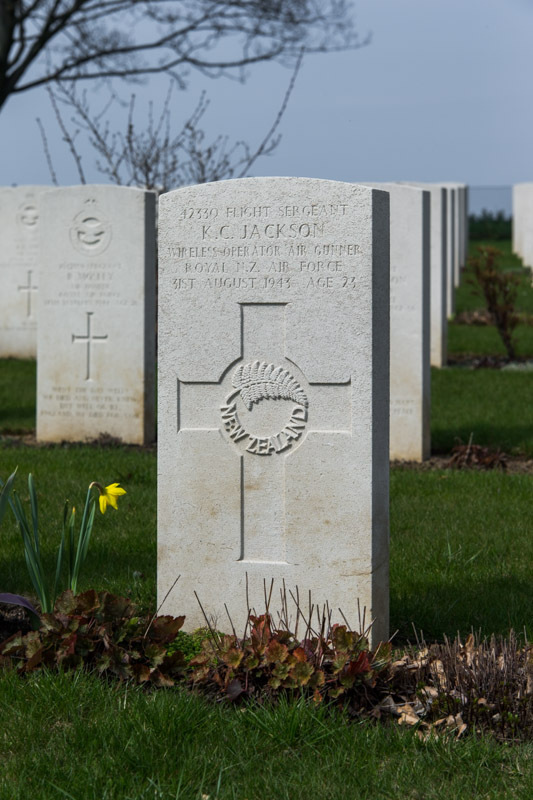 Conibear, the front gunner, was seriously injured and died in hospital; and SGT. Gwyn-Williams was injured (Rear gunner). The aircraft returned to base where a landing was made. P/O Rees was awarded the D.F.C. ; and the wireless operator, SGT. Lewis, was awarded the D.F.M. P/O William Jeffrey Rees, RAF 86395 – Pilot. Sgt. 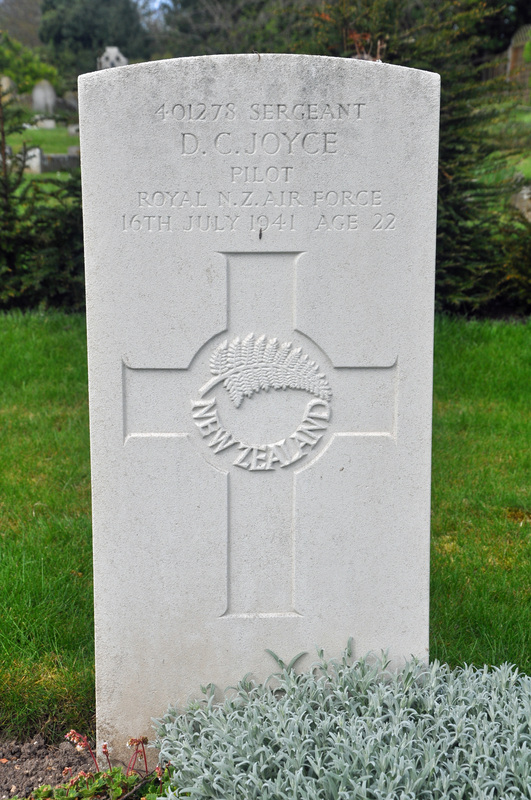 David Campbell Joyce, RNZAF NZ401278 – 2nd Pilot..
P/O Robert Cyril Adair Hunter, RCAF J.3754 – Observer. Sgt. 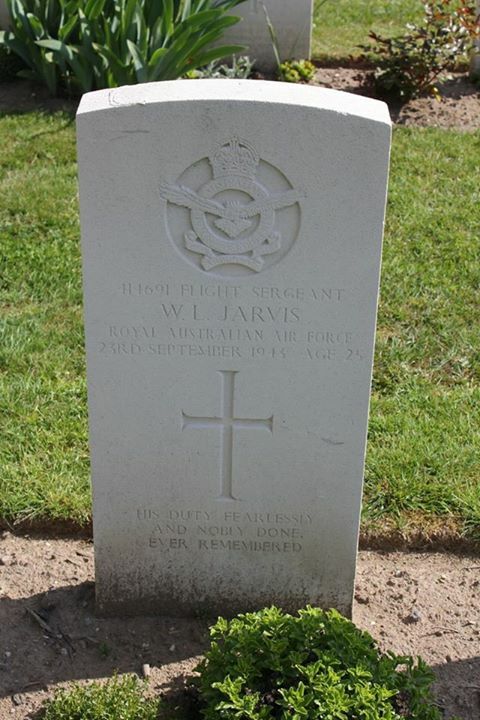 Ian William Lewis, RAFVR 952538 – Wireless Operator. Sgt. David Henry Conibear, RAFVR 932380 – Front Gunner. Sgt. Gywn-Williams, RAFVR – Rear Gunner. Son of Sebert Stephen Woodward Judd and Gertrude Dorothy Judd, of Mount Eden, Auckland, New Zealand. Sgt. Jack Leslie Jury, RNZAF NZ411764 – Front Gunner. Killed age 20 on the 12th of August 1942. Son of Francis Raymond Jury and of Elsie May Jury, (Nee Mccarthy), of Auckland City, New Zealand. Grave location – 24. F. 9.